UPDATE: the site now says it's "sold out online." 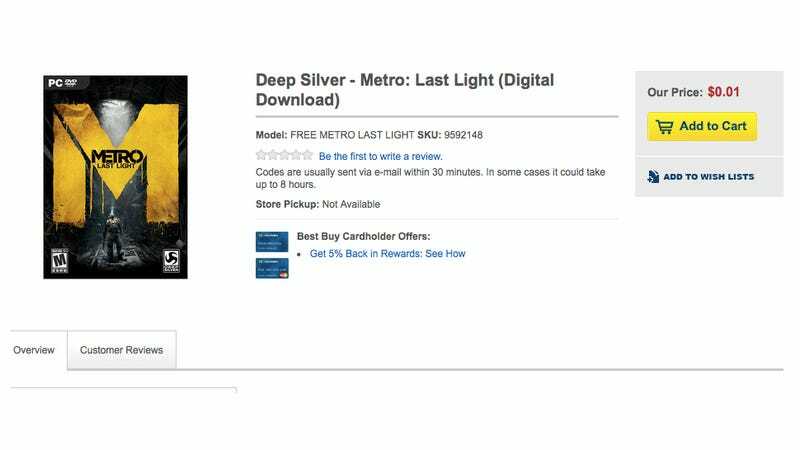 Original article: Looks like someone might've made a mistake...but here's Metro: Last Light for a single penny on Best Buy. Hopefully they honor the purchases. Unsure about purchasing the game? Read our review! Update: most people seem to be waiting for a code, but we have gotten some reports of people getting a code, too. Which is not to say this deal will last much longer; who knows! We've also gotten reports of orders being cancelled: basically, it's difficult to give you a clear idea in regards to what's going on. For a penny, though, I suppose it doesn't hurt to try anyway—and we've gotten more reports of this working than not, so.